Final Fantasy XIII-2 will be more like the what has come before in the series, says its producer and director. Final Fantasy developer Square Enix says that its goal with the upcoming Final Fantasy XIII-2 is to address all the criticisms that people had about its predecessor. Game director Motomu Toriyama says that XIII-2 will be much less linear, with much more of the exploration-based gameplay the series it known for. Toriyama said that Square Enix had taken all the criticism very seriously, and had handled it completely and thoroughly. Producer Yoshinori Kitase said that all the returning elements from Final Fantasy XII had been revised or had new features added to them. There were also new gameplaye elements as well. As an example, Kitase said that XIII-2 had a lot more mini-games, as their absence was something that people have complained about in XIII. He explained that one of the concepts behind Final Fantasy was that it was a melting pot of different game styles, and said that the team had made idea one of its priorities in XIII-2's development. It's always good to see developers taking criticism on board, especially if it results in better games. Hopefully Square Enix will be able to fix the pacing problems and other issues in Final Fantasy XIII and give fans of the series a game that they will really enjoy. 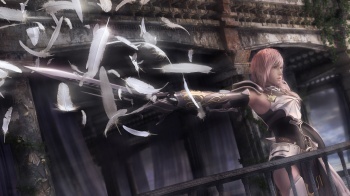 Final Fantasy XIII-2 comes out for PS3 and Xbox 360 in January.